As Easter approaches, La Grande Épicerie de Paris offers you inspiration with our chefs' Easter menu. Delicious creations from starters to desserts, for sharing a special time with family. Start your meal with our large Easter pie. Crisp puff pastry from our own pastry chefs encloses a delicate filling of green vegetables (peas, soya beans, broccoli, artichoke, chard and marrow-fat peas) and poached egg. The first cut reveals the delicate and colourful filling of this very sophisticated starter. 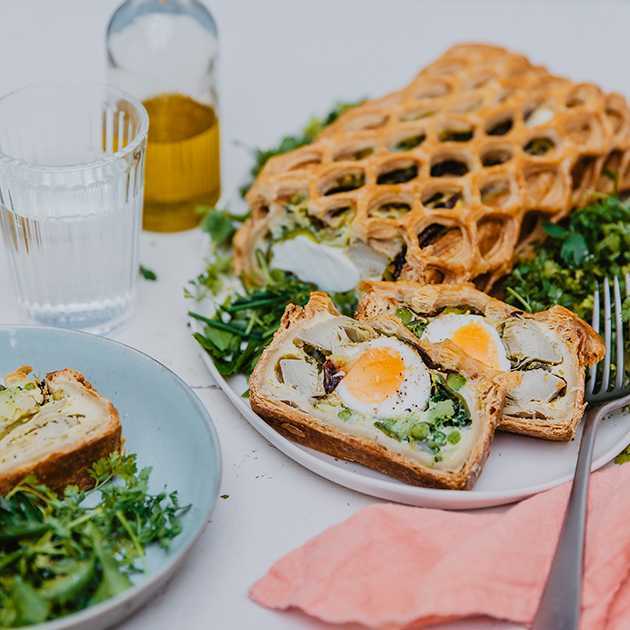 Find our Easter pie (€29.90/kilo) at the Gastronomy stands at La Grande Epicerie Rive Gauche. Renowned for its delicate flavours, lamb is one of the most essential Easter meats. This year, our chefs propose their own recipe, for a confit of lamb shoulder. Gently simmered in its own juices over 7 hours, this delicious lamb simply melts in the mouth. An exceptional delicacy, best served with new potatoes and cooked girolle, oyster or button mushrooms. 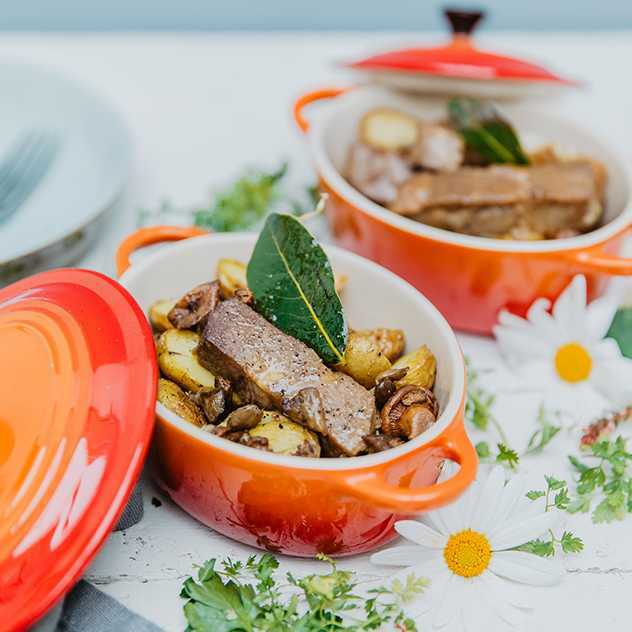 Find our lamb confit with garlic, as well as the new potatoes and cooked mushrooms (€10.90 serving) at the Gastronomy stands at La Grande Epicerie Rive Gauche. A cheese from Seine-Maritime, Brillat-Savarin IGP is traditionally made with cow's milk and cream. Try it stuffed with our chefs' own tasty sage pesto. It is also garnished with fresh herbs that are harvested on the roofs of Bon Marché Rive Gauche! 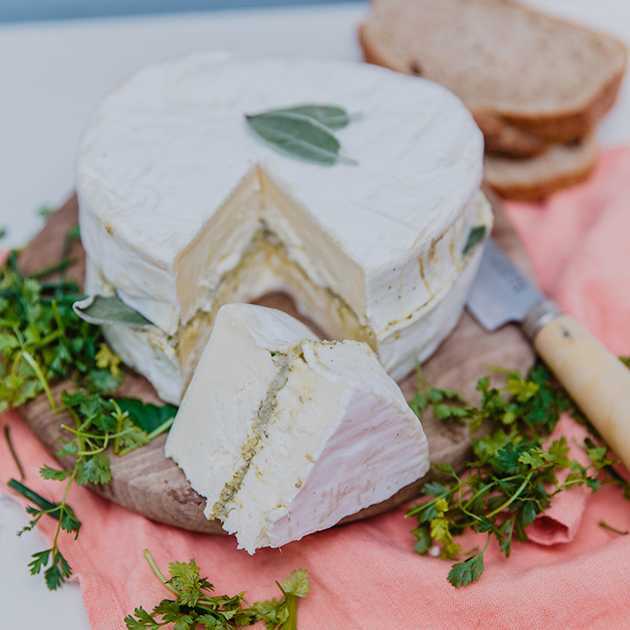 Find our Brillat-Savarin IGP stuffed with sage and fresh herb pesto (€19.90/whole piece) at the Cheese stands in our two stores. Surprise everyone at the end of the meal with our emblematic chocolate-based dessert. 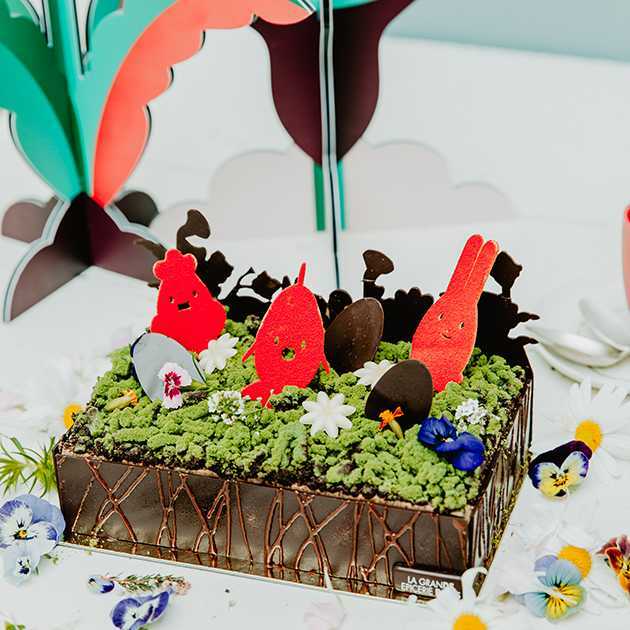 Recreating the joyful, fairytale world of the Easter garden, our chefs have created a spectacular decoration of crispy cocoa crumble, chocolate figurines and edible flowers. The poetic décor hides an incredible play of textures, with cookie, jivara milk chocolate mousse and vanilla crème brûlée. Find our Easter Garden cake in small (€7.50) and large (€45) sizes at the Pâtisserie stands in our two stores. Chick, rabbit or fish? This year, La Grande Épicerie de Paris is working with La Mutinerie chocolate-maker to offer you a unique collection of three chocolate figurines. These creations, made with dark chocolate 67% cocoa or milk chocolate 42% cocoa minimum, enclose a chocolatey fish as a delicious surprise. 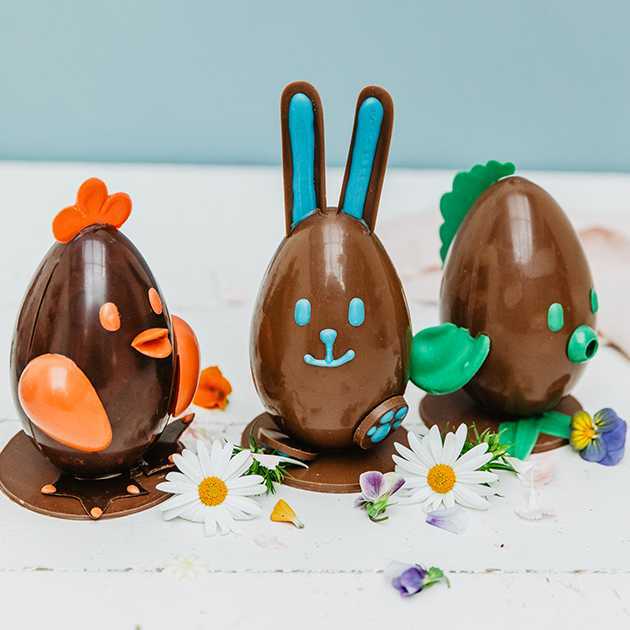 Come and try the 3 figurines made from La Mutinerie chocolate at La Grande Épicerie de Paris (€29.95 each) at the Pâtisserie stands in our two stores.